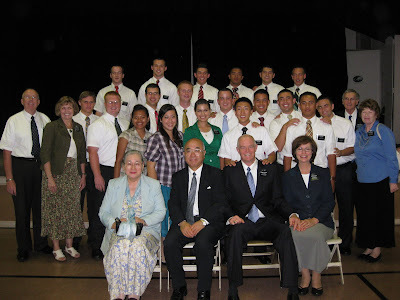 I've attached a photo from our zone conference/mission tour with our mission president and Elder Kikuchi. Transfers are this Wednesday and we just got transfer news last night. Both Sister Stevenson and I will be staying here, and Sister Matthew will go home (now that her mini-mission is over) and finish up her papers so she can go on a full-time mission. I'm really happy with the news because we're starting to see a lot of potential in this area and I'd love to see more success. I'm starting to connect with a lot of our investigators and am definitely not ready to leave! I'm also very happy to stay with Sister Stevenson as my companion because we get along really well. Some good news is that we have another investigator with a baptismal date! He's really solid so we're hoping that Satan's forces won't be able to overpower him and he can be baptized on September 12! If all goes well, we might have more than one baptism for this coming transfer! Yesterday in church, a member came up to us after sacrament meeting and said, "A girl just walked in all alone, so we invited her to sit with us. You might want to meet her." We went to meet her and found that she had kind of researched the church for a while and wanted to come and see what it was like. She stayed for all 3 meetings. She's originally from Japan, so Sister Stevenson was able to have a long conversation with her in Japanese. It's cool to see stuff like that happen. So the other day we were eating dinner at a member's home and I was looking at some wedding invitations and thank you cards they had dispayed and all of a sudden I saw a picture of a family at a wedding with our cousin Barbara right in the middle! I talked to the ward member and she said the Troy (Barbara's husband) and his family lived in this ward for a looooong time. So someone will have to tell Troy that I'm serving in his home ward! Other than that, there isn't much else to report. It's been a good week and the last transfer went by really FAST!